HIGH PRESSURE & SUPER EFFICIENT INFLATION - Achieve effortless & sweat-free inflation with our Micro Bike Pump which generates way higher air volumes per stroke & helps fill up a tire (UP TO A MAX OF 260 PSI) in a breeze - thanks to internal pressurisation that results in efficient air intake. STURDY & SMART - Made up of aerospace grade aluminium alloy, it boasts a rugged metallic construction & a lightweight (160g) build! The smart design of specialized pump allows it to CONNECT TO BOTH SCHRADER AND PRESTA VALVES without the need of any adapter. UNPARALLELED CONVENIENCE - with included METALLIC BRACKET, you can firmly secure both pump & bottle cage to the bike frame or simply slide it in your backpack. 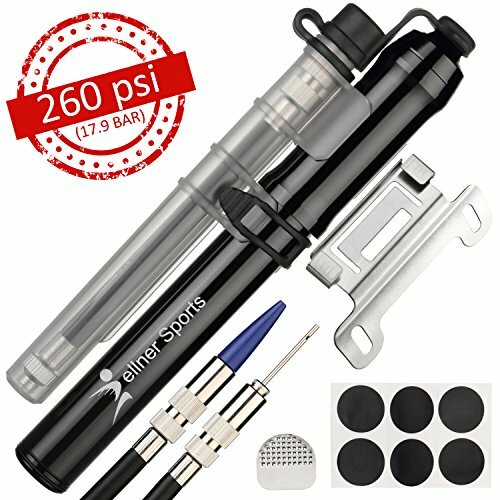 You also GET A BALL NEEDLE & BALLOON VALVE, which make it ideal even as a Ball Pump (for soccer, basketball, volleyball, football, yoga ball etc.) or Balloon Pump. HASSLE-FREE DESIGN - FLEXIBLE AIR HOSE seals on the valve stem perfectly, lowers the risk of air-leakage, makes it easy to connect the bicycle tire pump to the valve stem without putting undue strain (even in difficult to reach positions) & rules out breaking or bending of the stem! The universally compatible compact design is ideal as Road bike pump or Mountain Bike Pump, and can be used even for a BMX Bike, Motorcycles or electric cars! UNBEATABLE DEAL & GUARANTEE - It doesn't end here - besides the no-sweat inflation, you also get some essentials to handle emergencies like punctures. Yes, as BONUS you get a SET OF SELF ADHESIVE PATCHES & A GRATER to repair flat tires during a cycling adventure! Moreover, with our 100% Risk-Free Satisfaction Guarantee you have got nothing to lose. So, GO AHEAD & GET THE BEST BOOSTER BIKE PUMP, bike air pump or tire air pump that's compatible with all bike types! If you have any questions about this product by Wellner Sports, contact us by completing and submitting the form below. If you are looking for a specif part number, please include it with your message.